Biblical theologies are the breaking trend in Christian theology. Looking at theology as a comprehensive vision of the Scriptures, Biblical theologies attempt to draw out truths and themes from the Scriptures that pervade the text’s basic essentials. No Biblical theology is definitive or exclusive but work to grapple with the themes and texts often overlooked or underemphasized via systematic theology. 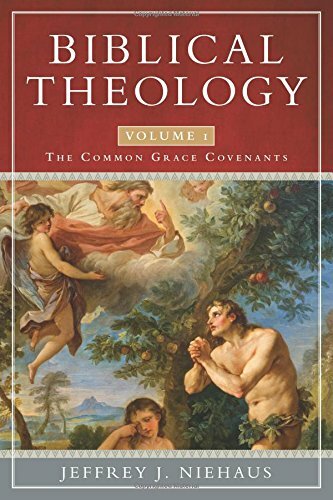 Jeffrey Niehaus’s Biblical Theology: The Common Grace Covenants (henceforth, CGC) stands in this growing trend with a profound emphasis on the covenant outworking of God in history. Both a poet and theologian, Jeffery Niehaus writes in an elegant, poetic, and occasionally frustrating way (e.g. long excursus on Cain building a city that ultimately is more about the Spirit than Cain, 138-153). This makes his mind perfect for the flowing, thematic theology associated with Biblical Theology. Even when discussing familiar subjects, Niehaus is thought provoking in his analysis, definitions, and conclusions. This should make him a pleasurable read for students of theology, pastors, and even interested laymen. In line with his covenant theme, Niehaus wastes no time stressing the Scriptures as “covenant literature” (2-4). This is the theme of CGC and in this volume the universal nature of God’s relationships with man and the general living of those under “common grace” covenants (stressed in pages 223-246) is emphasized. This covenant focus also has an impact on Christian beliefs. For example, in speaking on inspiration he goes so far as to say, “Scripture is the Holy Spirit taking the form of words” (26). While never crossing lines of conservative orthodoxy, Niehaus has a way of presenting old truth in poetic and challenging new ways. Niehaus’s definition of faith (14-20) and even his understanding of righteousness (187-191) exemplify how emphasis to God’s revelation and covenant with man effects impacts theology. As the title indicates, CGC covers the Adamic and Noahic covenant found in the first nine chapters of the Bible. Despite the small amount of Biblical pages covered, the subject matter is expansive. Niehaus demonstrates how YEC (young earth creationism) is not faithful to the ancient emphasis of Genesis 1-2 (39-50) and expounds phenomenally on the “form of God” (54-60). He walks perfectly through a covenantal understanding of “grace and works” (76-80) and is profound in describing the eschatological parousia of God in the garden and in the flood (105-106). His reflective provocations including an interesting discussion on “guardian angels” (122-123), a defense of Genesis 6:1-4 that does not permit a proleptic (165) or Mosaic reading (166), and the Noahic covenant not being redemptive or salvific (223). It is this last point that seems the most important to Niehaus’s theme of these two covenants being common grace covenants that still extend over the whole world. His strong link between Adam and Noah as covenant heads is quite good (198-199) but it does seem to leave strong questions of God being capable, or willing, to deliver Noah from judgment without a unique and selective covenant of grace. In conclusion, Niehaus’s Biblical Theology is a joy to read. It is pleasing to the mind (theology) as well as the soul (poetry). His sometimes strenuous and seemingly misplaced “excursus” are endurable given his excellent writing (e.g. his lengthy discussion of “territorial spirits,” 241-245). His theology is provocative yet orthodox. His emphasis on a historical-grammatical approach that looks forward to Christ has some insightful revelations. Though many will be unconvinced of how “common grace,” God’s deliverance actually was, Biblical Theology: The Common Grace Covenants is something to be heartily recommended to pastors, students and laymen alike.